Music festivals on the Costa Brava From 01/07/19 to 31/08/19. In the summer the Costa Brava becomes a real festival of music festivals. We are privileged to host a wide variety of wonderful musical events, some of which have become permanent fixtures in the country's cultural calendar and coincide in offering a programme of concerts featuring top national and international performers in very special venues. The Cap Roig Gardens Festival, in Calella de Palafrugell, is one such event. Top artists from the world of dance, jazz, classical music, world music and other genres perform in an auditorium installed in the magical setting of a botanical garden next to the sea. The Castell de Peralada International Music Festival will delight you with its wide-ranging programme of operas, zarzuelas (Spanish light operas), ballets, symphony concerts, recitals and chamber music in the stunning gardens of Peralada castle and the church of El Carme. The Porta Ferrada Festival, which has been held in Sant Feliu de Guíxols since 1958, is the oldest summer festival in Catalonia. 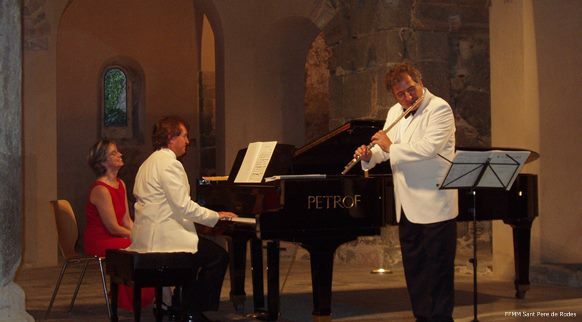 It consists of high quality music, dance and theatre performances in venues such as the Romanesque church of the monastery, the Municipal Theatre - Auditorium, the Casa Traschler and the courtyards and gardens of some important buildings. The Torroella de Montgrí International Music Festival is a welcome addition to the summer cultural calendar, filling the fantastic old quarter and other parts of the town with the best classical music, world music and other surprising offerings.